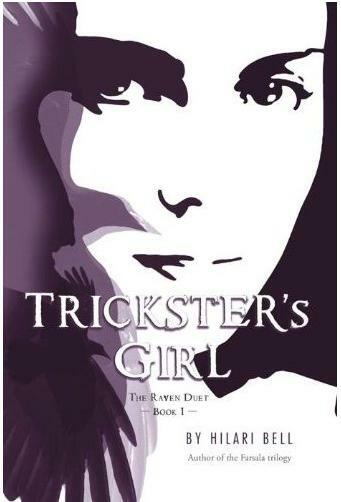 I get to be a part of the Teen Book Scene tour of Hilari Bell's newest book Trickster's Girl (Goodreads | Amazon ). For this stop I got to ask Hilari anything I wanted. Check it out! Many people believe that character names can make or break a book. Do you agree? How do you choose your character names? What makes a "good" name for you? I'm not sure I believe that character names can make or break a book, but they do need to be right for the character. A lot of times the name just comes to me with the character, but sometimes I have to modify that name to fit my world. For instance, Kelsa was originally Kelsey, but someone in my writers group pointed out that I should move that name forward a bit, since I was writing SF. And the heroine of the gypsy steam-punk novel I want to write next was originally Kiev, like the city in Russia. But she exists in another world, where several kinds of magic also exist, and I didn't want to name her after a city in this one, so I just started running down the alphabet. Biev, Ciev, Diev, Eiev... I actually do that a lot with names, start with something that's close and run through the alphabet, just changing one letter. And of course in a novel loosely based on Ancient Persia, most of the names are loosely based on Ancient Persian names--with the spelling changed to make them work better for modern readers. And to differentiate them at least a bit from the characters in the real Persian myths--because I changed the myths too. One point I would like to make about names--there's a school of thought in SF that everyone should be named Bob. Or if not Bob, some sensible, English language name that readers can easily read and pronounce, and not trip over. To all those people I say, phoodreckia on you! Back when I was a teen reader, I read a couple of historical novels by Allen Drury, set in Ancient Egypt. He started his story with an author's note stating that many of his historical characters were real people, so he pretty much had to use their real, Ancient Egyptian names--no matter how polysyllabic. He said that those names were actually beautiful and fun, but you had to take a few minutes to break them into syllables, and then learn to say them. Take Ankhesenpaaten. Looks impossible, right. But just give this a try. Ankh e sen pa aten. Anything there you can't say? Repeat it three times. Ankh e sen pa aten. Now put it the two parts together. Ankhesen paaten. Ankhesen paaten. Now the whole thing Ankhesenpaaten. You can learn to say this name in less than a minute, and it's fun to rattle it off! And how many people know that Nefertiti's full name is Neferneferuaten. Nefer neferu aten. Say it three times, and you can rattle it off and impress people at parties. That wasn't so hard, was it? And if you're writing fantasy or SF an inscetoid alien named Joe, instead of Jssshot, or a dolphinish creature named Kip instead of K'ket just doesn't work. It's just laziness that stops people from attempting an unfamiliar looking name in a book--and sometimes shyness that keeps them from trying an unfamiliar name in real life--because we're afraid of offending people when we get it wrong. When I worked in the library, I ended up requesting books for people with names in languages I knew I couldn't pronounce correctly. Tai in particular, and some of the Indian/Pakistani names. Most of the librarians just asked, "And how do you spell that, and the clients spelled it, and the librarians never tried to say their names. After a while, I began to find that kind of rude, so I'd look at this strange, probably tonal pile of syllables, and I'd say, "Mr. ... Djerti? Is that how you say it?" And watched the faces of these immigrants light up with delight that one of those crazy Americans was actually trying to say their name. And they'd correct my pronunciation, and I'd try a couple of times, and probably never really get it right. But in several decades of doing this, I never found anyone who was upset that I pronounced their name wrong, and most of them were clearly pleased that I was willing to try. So I make no apologies for the fact that the Navaho Shaman who put together the medicine bag in Trickster's Girl is Atahalne, and not Bill. At a hal ne. At a hal ne. Ata halne. Ata halne. Atahalne. It's not that hard. I fully believe names can make a book pop. Hilari is so funny. That would be terrible if everyone's name was Bob...especially all the females in the world. I actually love the name Atahalne. It sounds Japanese in my mind (which probably means I'm saying it wrong...) but oh well! Great guest post idea.